“Still small and uneven” is what you will pick up from winemaker conversations. As the pressing season is coming into full swing across the Cape Winelands, let’s have a look at what is to be expected of the 2019 harvest. The 2019 harvest size is also influenced by climate conditions. Unseasonal cold combined with rain and wind during Spring 2018 hampered fruit set and resulted in uneven grape bunches. If temperatures under 15 degrees occur during the flowering season, flowers open irregularly or not at all, resulting in uneven or even no fruit set. The effect is a combination of big and small as well as ripe and green berries in the same bunch or bunches on the same vine. We started with our Franschhoek harvest mid-January. Our analyses show significantly higher acidity than usual and it can be attributed to the relatively cool summer we had until the end of January and also to the unevenness and unripe berries and bunches in between the harvested grapes. With red grapes, it is easier to sort and remove the unripe berries, but it is slightly harder with white (green) grapes. Talking to La Motte Cellarmaster, Edmund Terblanche, he is positive about the acidity, “It is a luxury in a warm country like South Africa”. He expects freshness from the 2019 vintage and when wines are well-balanced, good maturation potential. To manage the balance, the overall ripeness of grapes harvested has to be carefully monitored. With only a little summer rain, cooling afternoon winds and moderate temperatures, grapes are healthy with well-defined flavours and good intensity. Although they might be uneven, the looser bunches prevents rot and the fact that we have sufficient water for supplementary irrigation is of course reason to be thankful. The February heat is upon us, however, and as we are still to start harvesting in the Cape South Coast areas such as Bot River and Elim, the harvest is all but determined. 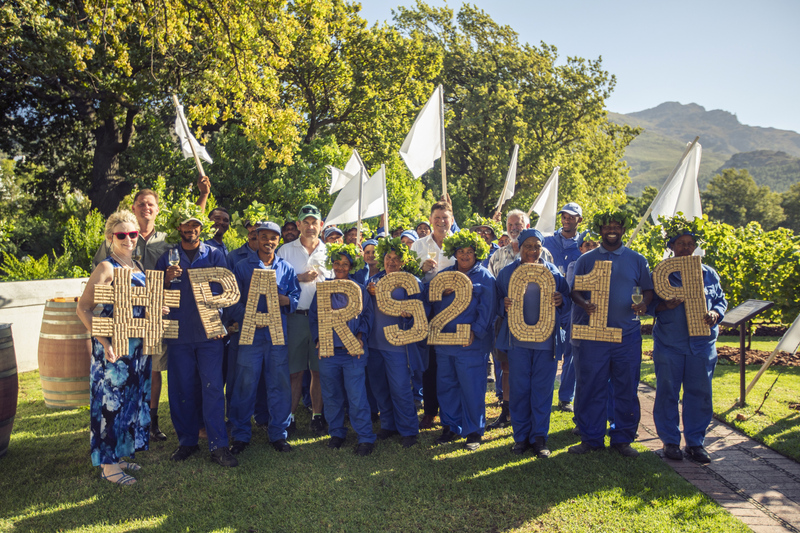 Each year, we celebrate with a Blessing of the Harvest ceremony at La Motte. With the drought still fresh in our minds and drought-induced failed harvests in other sectors of South African agriculture, we know that we have a lot to be thankful for. A knowledgeable, dedicated and enthusiastic team is of course another blessing and when we get those freshly-baked mosbolletjies with our morning coffee, it is hard not to get caught up in the energy of this special time in the Winelands. Image caption: With Hanneli Rupert-Koegelenberg and the La Motte Vineyard team.